Blackstar's first artist signature product! PRESS RELEASE: Blackstar are proud to announce the launch of their first artist signature product. Developed with influential guitarist Gus G (Ozzy Osbourne, Firewind) the HT-Blackfire is a two channel, valve-driven, metal distortion pedal. Gus G began his relationship with Blackstar when he used the Series 1 200 amplifier to record the latest Ozzy album. Since then Gus has become a full Blackstar endorsee and can be seen on stages throughout the world with his momentous guitar rig consisting of 12 x Series One 200 heads and 12 x Series One 4x12 straight fronted cabinets! Gus also used the award winning HT-Dual pedal and approached the Blackstar R&D team with the aim of producing the ultimate heavy metal valve distortion pedal. After many months of listening tests with the young guitar hero, the HT-Blackfire was born. 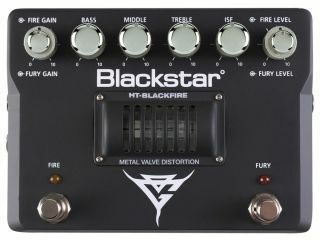 The HT-Blackfire is a dual channel valve distortion pedal. The channels are named after the fan-favourite Firewind track 'The Fire And The Fury.' The 'Fire' channel delivers a high gain classic distortion, while the 'Fury' channel takes you to screaming lead and beyond. Other features include an ECC83 valve, patent-applied-for ISF control, independent Gain and Volume controls for each channel and an industry-standard speaker emulated out. Limited to just 1000 pieces worldwide, each pedal includes a certificate of authenticity signed by Gus G and an exclusive Gus trading card.